Relax and Enjoy the Outdoors. Entertain in Style and Beauty. Our gazebos will give you years of enjoyment while enhancing the beauty of your property. Whether it’s Wooden, Cedar or Vinyl our gazebos are made with only the highest quality of construction and detail to present you with a useful product that will last for years to come. 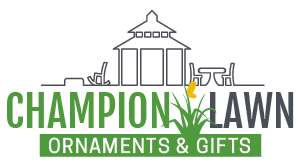 Here at Champion Lawn we strive to bring you the highest quality gazebos at the most affordable price. Painting of Gazebo includes Perlins & Rafters to produce a crisp detail in contrast against the cedar shingles. Maintenance Free Vinyl Gazebos mirror the wood gazebos in style and appearance. No need to spend time sealing, painting or staining as the durable vinyl material will not fade, crack, rot or peel. Vinyl has become a popular choice for busy homeowners who want their gazebo to retain its fresh, crisp new look for years to come. Vinyl gazebos are available in two colors; white and ivory. Our vinyl gazebo floors are made from a composite decking material that has an incredibly, true-to-life, wood grain finish you’ll love. Again, no sealing, staining or painting is required so it saves you time and money. The decking is also environmentally responsible as it contains recycled materials. There are three natural colors to choose from: Cedar, Redwood and Cape Cod Gray. You need to have prepared site to place your gazebo on. Your site must be level. This may require some digging to eliminate grades or humps. We recommend allowing sufficient time to prepare the site prior to delivery. This will result in an attractive installation and less ongoing maintenance for you. After the site is leveled we suggest adding 3 to 4 inches of 2B gravel to the site. Please call for current delivery charges. On long distance or out of state hauling these charges apply plus any tolls or permits.